More than 3,000 students of a school for orphans and children from low-income families in Ajman will be in for a surprise once classes resume on Sunday. 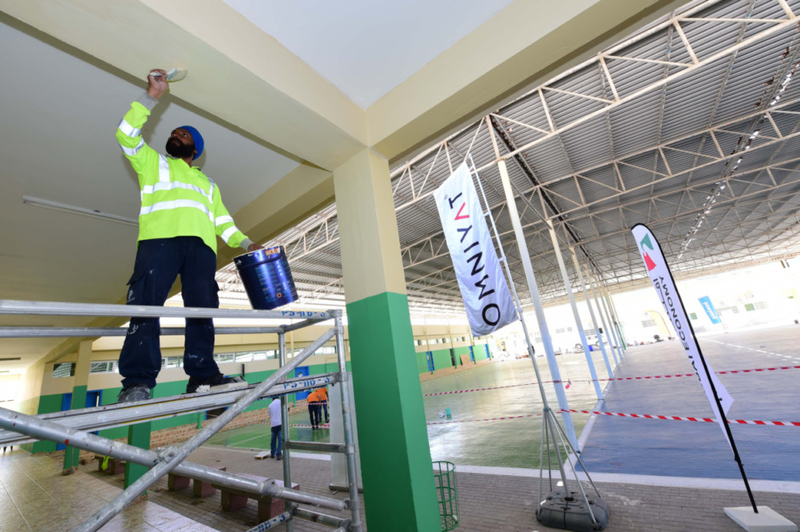 Their school, the Manal Al Eman Charity School, will be handed over following a monthlong makeover organised by Dubai Economy (formerly Dubai Department of Economic Development) and developer Omniyat Properties as part of the Year of Giving. The refurbishment is the first project by the two organisations as part of their joint initiative ‘Tarmeem’, which means ‘restore’ in Arabic. The school, which opened in 1984 with 30 students, is now home to 3,500 students from 36 nationalities from grades 1 to 12. Once the makeover is complete on Sunday, students will walk into 22 restored classrooms, complete with new doors, windows and full installation of air-conditioning. They will have two playrooms and a sleeping room for babies, an outdoor play area, sports area with football, basketball and volleyball pitches, a brand-new reception and a new courtyard entrance. “The school looked totally different before. It had cracks on the wall because it’s been operational since the 80s. With this many students, we hold two shifts to accommodate all of them,” Saeed Al Baloushi, the school manager, told Gulf News. “The restoration work is important for us since we are a charity school. We do not charge fees to the students and are relying only on donations from the community and from the Ajman rulers,” he added. Mohammad Humaid, Marketing Sales Director at Omniyat Properties, said students deserve the gift. Humaid added that the project was made possible through the help of 28 other companies and individuals, namely, BASF, ATELIER N5, MTE Middle East General Trading, Emma Paine, Celer Group, Manser Saxon Dubai, Interni, Optimum, JML Facades, Clarke Samadhin Associates, Plafond Fit Out, Marwan Ali, Furniture Factory, Complete Building Supplies, Stephanie Neville, Transguard Group, NASS Scafform Services, Academia Management Solutions International, Graphics Hub LLC, Omnicom Media Group MENA, Premier Irrigation and Landscaping, Jotun, J20 Sports, Al Garhoud Private Hospital, Careers Coaching Development, Falcon Pack, Shamsa Alabbar and artist Saji Kumar.